Food has been and continues to be an essential part of any movement for progressive change. From home cooks and professional chefs to local eateries and bakeries, food has helped activists continue marching for change for generations. Paschal's restaurant in Atlanta provided safety and comfort food for civil rights leaders. Elijah Muhammad and the Nation of Islam operated their own farms, dairies and bakeries in the 1960s. "The Sandwich Brigade" organized efforts to feed the thousands at the March on Washington. 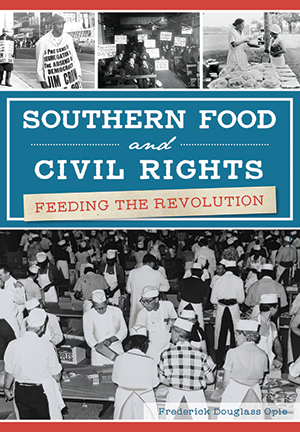 Author Fred Opie details the ways southern food nourished the fight for freedom, along with cherished recipes associated with the era. Frederick Douglass Opie is a professor of history and foodways at Babson College and the author of Hog and Hominy: Soul Food from Africa to America; Black Labor Migration in Caribbean Guatemala, 1882–1923; Upsetting the Apple Cart: Black and Latino Coalitions in New York From Protest to Public Office; and Zora Neale Hurston on Florida Food: Recipes, Remedies and Simple Pleasures. Opie is a regular contributor on the radio show The Splendid Table.